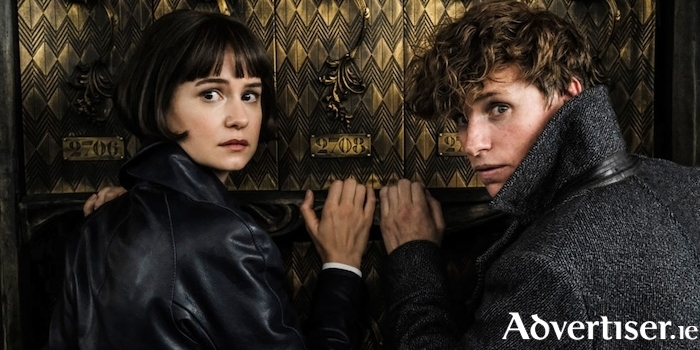 Katherine Waterston and Eddie Redmayne in Fantastic Beasts: The Grimes of Grindelwald. I WAS 11 when the first Harry Potter book came out, the same age Harry is in the story. I read those books - and only those books - repeatedly for a good 10 years (If I’m being honest 20 years ). The idea of a spin-of series didn’t massively appeal to me when it was announced, but this is one of the most lucrative franchises in the world. There was no way it wasn’t going to happen. I didn’t love the original Fantastic Beasts, based on a text book in the original series, but was nonetheless intrigued by the concept of The Grimes of Grindelwald, which depicts Dumbledore as a young man, and which builds up to his famous duel against his former friend Grindewald. Dumbledore was always one of the deeper characters in the books so a look at his youth sounded good. We don’t see the story from Dumbledore's perspective though. Our returning hero from the first Fantastic Beasts movie, magizoologist Newt Scamander is the hero here. He is asked by his old professor, Dumbledore, to help track down a recently escaped Grindelwald in Paris where he holds anti Muggle rallies - imagine a kind of magical Donald Trump. At the same time he’s trying to reconnect with his love interest from the first film, Porpentina Goldstein. Rowling herself wrote the script. The script isn’t the only issue here, but the script is bad. The dialogue in her novels (particularly in the Harry Potter series ) always read so well to me. So I was surprised how awkward and unrealistic the interactions were here. Even worse is the fact the story just is not very compelling. With so many characters' stories spanning the globe we get barely any time with any of them. In fairness to the cast they do their best. Eddie Redmayne as Newt Scamander is really good. Jude Laws' Dumbldore is the best on screen version of the character we have yet seen. Zoe Kravits is great as Leta Lestrange, and the flashbacks of her and Newt in Hogwarts are a highlight. The rest of the cast do a fine job, bar Johnny Depp [pictured above] who is the acting equivalent of the Emperor's New Clothes. He hasn’t been an enjoyable on-screen presence in 20 years and seems he like hasn’t been a very enjoyable off screen presence ever. The entire film seems like one run-on sentence (bit rich coming from me I know ). The editing is a mess, the story is virtually incomprehensible. Even massive fans of the books will be lost and confused. I cannot imagine someone who has not already seen the original films having any idea what is going on. The whole movie feels like a televisions show doing a 'last time on...' montage, but for two and half hours and there was no TV show. I have faith Rowling will right the ship in the upcoming planned films. I have faith she still has magic. But this is tough to take.